The snow is melting, the weather is slowly getting warmer, and after what has felt like an extremely long winter, spring is finally here. For Ontarians who love driving, with spring comes a deep-seated yearning to take to the road in a brand-new vehicle. There is nothing quite like the feeling of a brand new engine purring under the hood, as you relax into fresh upholstery, and if your current vehicle has been left the worse for wear by a hard winter, make this spring the one when you finally experience that new-car feeling. If you are thinking about purchasing a new car this spring, Yorkdale Dufferin Mazda is the first place to start looking. We offer a full range of Mazda vehicles, and whether you are looking for a family-friendly sedan, versatile station wagon, adventurous crossover SUV, or a fun summer roadster, we have a Mazda that will suit both your lifestyle and your budget. Yorkdale Dufferin Mazda is the premium Mazda dealership in Toronto, and our automotive experts would be more than happy to advise you on the best new and used Mazda vehicles. Most Canadian shoppers are most familiar with the legendary Mazda 3, one of Canada’s favourite cars and a perennial favourite for its versatility, reliability, and timeless sense of style. Available as a hatchback or sedan, the Mazda 3 is perfect for people who need a car they can rely on to perform well under a range of circumstances, and want it to look sporty while doing so. 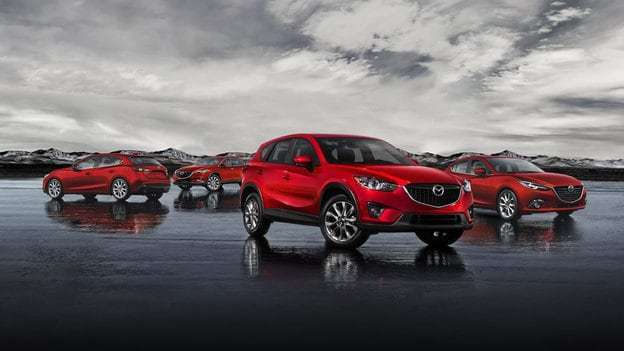 However, our collection of Mazda cars goes far beyond the Mazda 3, and if you think an SUV might be more your style, Yorkdale Dufferin Mazda has a full range of crossover and full-size SUVS. The most popular Mazda SUV is the CX-5, ranked the #1 compact SUV by U.S. News and World Report for its excellent handling, sumptuous interior, and comfortable driving experience. The CX-5 offers responsive, dynamic handling and good gas mileage, and is the vehicle of choice for drivers who want the power and energy of an SUV and the agility and efficiency of a smaller car. For shoppers who are looking for the full-size SUV experience, there is the CX-9, Mazda’s largest SUV and the one best suited to families looking for a vehicle that can fit everyone in comfort and style. In addition to the compact and full-size options, Canadians are also starting to pay attention to the CX-3, Mazda’s subcompact SUV. The CX-3 is notable for its zippy handling and innovative design, and is a favourite among urban commuters who want a vehicle that can handle congested city streets and weekend trips to the cottage with equal aplomb. You can find all of these Mazda cars for sale at extremely competitive prices at Yorkdale Dufferin Mazda, and if you want to get one of these new Mazdas at an even lower price you should check out our monthly deals. If spring tune-ups have you worried about whether or not your current car can make it through another winter, and if wondering whether it isn’t time to purchase a new vehicle, stop by Yorkdale Dufferin Mazda and discover which Mazda vehicle is right for you.